Right Now | hitler in hollywood? A book alleging “collaboration” between Hollywood studios and Hitler’s government has generated controversy. Historians often describe Hollywood studios during World War II as crusaders against the Nazi regime and staunch defenders of American democracy. They cite Warner Brothers’ Confessions of a Nazi Spy, made in 1939, and Charlie Chaplin’s 1940 film, The Great Dictator, as evidence of Hollywood’s stand against Hitler. But a new book by historian Ben Urwand, a junior fellow of the Society of Fellows, challenges that interpretation. Based on nearly nine years of archival research in Germany and the United States, the book reveals a surprisingly cooperative relationship between studio executives and German officials throughout the 1930s. The Collaboration: Hollywood’s Pact with Hitler (Belknap Press of Harvard University Press), details how major studios, seeking to keep the German market open to American films, not only changed their films, but even shelved entire productions at the request of Nazi diplomats. Correspondence between the studios and German government officials in the 1930s frequently contains the term Zusammenarbeit—which Urwand translates as “collaboration”—to describe this partnership. On an early research trip to the German federal archives in Berlin, Urwand found notes on Adolf Hitler’s opinions of Hollywood movies, recorded by his adjutants. (A voracious cinephile, the German leader screened one or two movies a night and saw them as a force to shape public opinion.) But details of the meetings between Hollywood and the Nazis were hard to hunt down. At the political archive of the German Foreign Office in Berlin, Urwand found that the only files remaining from the German consul in Los Angeles fit in a shoebox. When he returned to the archive on a later trip, the archivist—slightly exasperated to see him again—suggested that he review the files of other German embassies and consulates. There he found evidence that after the Los Angeles consul’s regular meetings with studio heads, he sent reports to Nazi officials in Berlin about the cuts the studios had agreed to make. Berlin would then instruct its diplomats around the world to see the movies in their local theaters to ensure the changes had been made globally. Why did Hollywood comply? 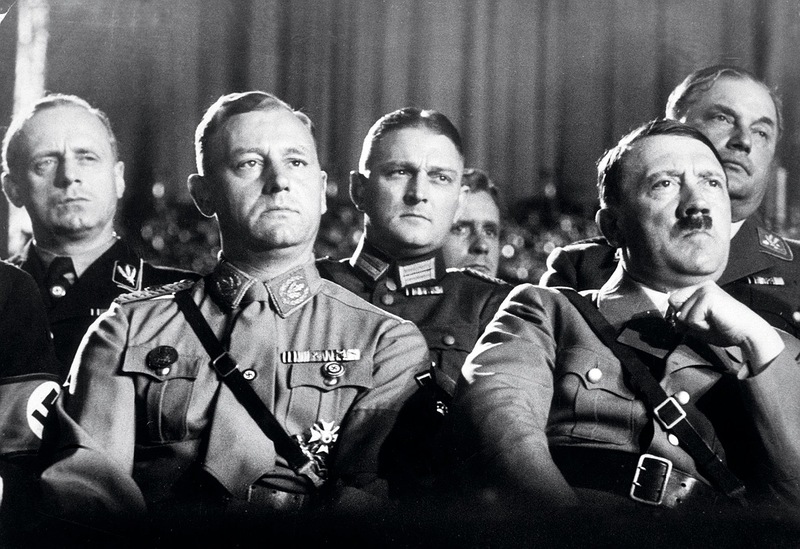 In 1932, six months before Hitler came to power, Germany adopted a law stipulating that any film company caught making anti-German (or later, anti-Nazi) films would be prohibited from doing business in the country. For studio executives who feared losing access to German audiences, it was a powerful threat. Before World War I, Germany had been the second-largest market for U.S. films. By the 1930s, the studios were no longer making money there, but they hoped business would improve in time. Urwand says Hollywood executives also worried that if they left Germany and Hitler started a war, they would be expelled from any countries he invaded.So studio heads, many of whom were Jewish, collectively boycotted a proposed film, The Mad Dog of Europe, about the mistreatment of European Jews, and agreed to fire most of their Jewish salesmen in Germany.